Synopsis: Five short films based on the human senses. 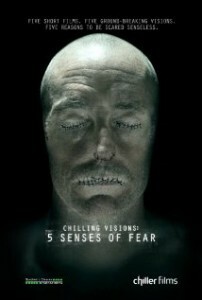 My Quick Review: If you find yourself wanting to quit watching Chilling Visions after the first 2 or 3 stories, DON’T. The last 2 stories alone make Chilling Visions worth investing your time into it. All the stories in Chilling visions are somehow interconnected, not only through their themes (the human senses) but also through the recurrence of a big corporation doing experiments and products based on the 5 senses. The first segment, Smell, directed by Nick Everhart is about an elixir that gives attractiveness to the person using it, but has devastated side effects. The story is a bit on the goofy side and feels like an average episode of Tales From the Crypt. The second one, See, by Miko Hughes follows an ophthalmologist turned vigilante who can capture people’s visions. While the pitch is intriguing the output is too conventional and way too predictable. The third story, Touch, is directed by Emily Hagins who made headlines a few years back when she directed her first full feature zombie movie when she was only 13. Here, a blind boy is in a car accident with his parents, looking for help in the woods where a serial killer awaits. This short might be the weakest of the bunch mainly because of a pointless script. The last story, Listen, from Jesse Holland and Andy Mitton (Yellowbrickroad) takes the found footage angle and shows us disturbing footage about a song that can kill people listening to it. This story is again strongly connected to the one before and culminates in a great gory scene showing what happens when a guy plays the song in front of other people. Thanks to the last 2 stories (that deserve the title chilling) and the fact there is an unifying theme connecting them, I can say that Chilling Visions is a must see for horror anthology fans. Since it was shot on a very tight budget and under 4 days for each segment, I can only applaud the whole project and hope for a sequel that could share even more light on the mysterious corporation playing with our senses. Click Here to Watch Chilling Visions: 5 Senses of Fear Online Now!